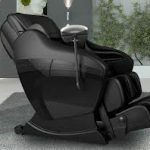 The Panasonic MA70 massage chair. Highlights of this massage chair include heated jade rollers and an ottoman that can rotate under to hide the calf and foot wells. Panasonic massage chairs is the best reviews. The MA70’s revolutionary thermal ceramic heated rollers themselves, massage the back, neck and shoulders to melt away stiffness.